I know my readers are expecting a 'Film Friday' today but my blog has no rules. Today I'm going to continue my '25 Book Challenge' which I will most likely fail. The year is almost over and I'm not even half way to my goal. I'm a slow reader who is always busy (excuses!). 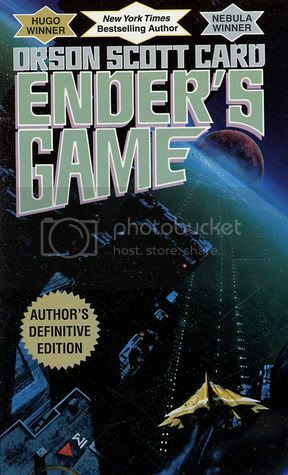 So Ender's Game written by Orson Scott Card is one of those books that most of my friends read as a kid whereas I never did. I really do like old science fiction novels and young adult fiction; Ender's Game is the perfect blend of the two. It was originally published in 1985 and won the 1985 Nebula Award for Best Novel and the 1986 Hugo Award for Best Novel. It's somewhere in the future and the world is at war with an alien spices resembling insects. Buggers. Young children are trained at a very young age to become soldiers. Ender Wiggin is one of them. What was so great about this book is that I did not know much more than that when I started reading so that's all the exposition I'm going to give you. I really liked this book; couldn't-put-it-down-want-to-write-nerd-rock-songs-about-it liked it. I'm not sure where this passion is coming from but I really really like Ender as a character and just know that some parts of the upcoming movie version will disappoint me. (Oh look, I AM tying this post in with Film!) However since Orson Scott Card wrote the screenplay himself there are higher hopes there. After reading the Wikipedia page on the film (which is full of spoilers for the book!) I at least know the changes going in and I won't be unpleasantly surprised. The movie will probably be very good but I know I will always prefer the book. If you are toying with the idea of reading it prior to seeing the movie, please please please DO THAT. I did not finish reading The Lord of the Rings trilogy till after the first two movies came out and I really wish I had not waited. That being said, the books are among my favorite books of all time regardless of the good but not great films.